I’ve had clients recognized in this magazine; you could compete for the same in Chicago. If you’ve incorporated some fresh benefit auction ideas into your gala, perhaps you should be recognized for your work? Here’s one way to get a feather in your Auction Chair (or event management) cap. Submit your event to BizBash Chicago. Though there doesn’t seem to be any specific award for benefit auctions specifically, you can still submit your gala into almost 20 different categories differentiated by budget, concept, and other elements. 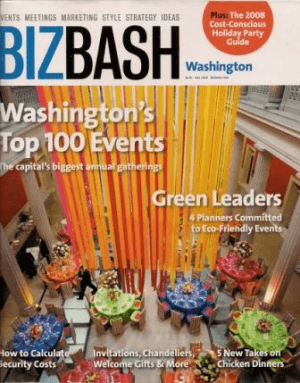 I have had two auction clients in 2008 and one client in 2009 selected for inclusion in “ events as judged by BizBash magazine. Now you can do the same in Chicago. Think of how excited your volunteers would be to be a part of a “can’t-be-missed gala,” as judged by a third party? You could use an award in your P.R. campaign. I’ve only seen advertisements and deadlines for the Chicago market. Your event (charity auction or otherwise) must have taken place between June 1, 2009 and May 31, 2010. Private social events are not allowed for judging. (I’ve yet to see a “private” benefit auction anyway). You’ll need to submit up to five photos and a 400-word description of the event. The description should address all the standard stuff: event purpose, target audience, intended result, guests’ reaction, and other companies involved in the success of the gala (like, AHEM, your benefit auctioneer company). Here’s the kicker: The Chicago application is due 5 p.m. CST this Wednesday, July 21, 2010. Those of you organizing Florida benefit auctions, it appears that those deadlines aren’t until 2011. You’ve got time to prepare and make sure your final photos are perfect for the application. There doesn’t seem to be anything about the Washington, D.C. awards right now, though from a conversation I had with the editor a couple of years ago, I know the D.C. awards — at least at that time — had been chosen by a set of panelists and not via a “submission” process. Maybe that’s in the works to change. Good luck to all of my Chicago readers! Benefit Auctions v. Online Nonprofit Contests: Where’s the payoff? Cool contest! Would love to see who wins. Sherry, I’m learning something new here! Thanks for the post and let us know about the winners. Sherry, It is great that some benefit auctions are getting praised right along side of other top-rated auctions. However, it sounds like a new category needs to be added or someone else needs to establish an annual benefit auction award. Do you know anyone who might be willing?? ?